A few weeks ago a friend kindly gifted me with a book after a conversation that we had. She recommended I read the book 10% Happier by Dan Harris after mentioning to her that meditation was something that I wanted to understand and try. Even though I have a stack of “to read” books waiting for me to plow through, I decided to read this one now. I’m glad that I did. Dan Harris is a journalist for ABC News. He is currently co-anchor of ABC’s Nightline and the weekend editions of Good Morning America. I will admit that I never heard of Dan Harris before I read this book. We do not have cable TV, and I rarely watched the news when we had it. So, I was coming into this book with a clean slate of no bias. In 10% Happier, Dan talks about his experiences with trying to quiet his mind that was nearly ruining his career. He speaks about his on-air TV incidents where his mind completely melted down on air. Even though he was a seasoned TV personality, he suffered from panic attacks when in front of a camera. Voices of self-doubt and performance anxieties had gotten the best of him. So, to rid himself of that, he used his access as a journalist to find a pathway to mindfulness. With his easy flowing style, Dan often uses a lighter tone with many comic breaks to describe various interviews and assignments. Each experience had lead him to be a leader in mindful living. His interesting interactions with Deepak Chopra, the Dalai Lama, Joseph Goldstein, Pastor Ted Haggard and many recognizable ABC News personalities are all written in great detail. Dan also writes about some of his assignments in the Middle East that were less than ideal. Dan holds nothing back as he talks about his drug use in trying to deal with his anxieties. He writes about how making one mistake in show business can lead to unemployment. This constant pressure eventually broke him down internally . Ultimately he could no longer stand the voices of self-doubt in his head. To escape the pressure he became a regular cocaine user and dallied in ecstasy. The constant battle is well highlighted in this book of being high and maintaining a high-profile career. While Dan’s career experiences were captivating, it was when he wrote about his experiences with Buddhism and meditation that brought the book alive. He spoke in depth about a ten-day meditation retreat. His raw and often comic writing style gives the reader a sense of realism. Often, I felt as though I was right there with him. I could easily tell that meditation changed his life as I could feel his calmness through his thoughts near the end of the book. In conclusion, I found “10% Happier” to be a fantastic and easy read. At times, I could not put the book down which is why I was able to finish it in three days. Dan’s ordinary person approach to mindfulness and meditation are well written in this book. His openness helps removes the stigma that is often attached to meditation. By reading this book, I now have a good start into my meditation journey and I am now more curious than ever before on Buddhism -so much so that I purchased a book on its teachings. I highly recommend this book to anyone who has a curiosity towards meditation. You will find it’s a natural flow to read and its captivating stories are motivational enough to get you to start meditating and practicing more mindfulness in your everyday life. This effort by Dan Harris is not your typical self-help book, it’s fascinating! 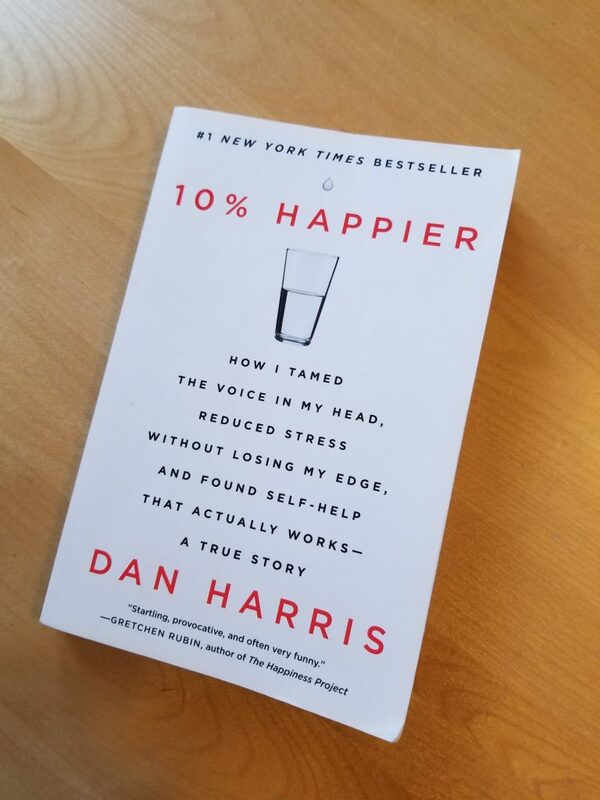 I give 10% Happier by Dan Harris 4 stars out of 5.